Lori Taylor, founder of The Produce Mom is a proud ambassador of OptUP. Eating more fruits and veggies can take some encouragement — OptUP for a healthy shopping experience! Kroger makes sticking to those “eat more fruits and veggies” New Year’s resolutions easier than ever with their new OptUP app! Have you tried it? It’s pretty fantastic, and fun too. 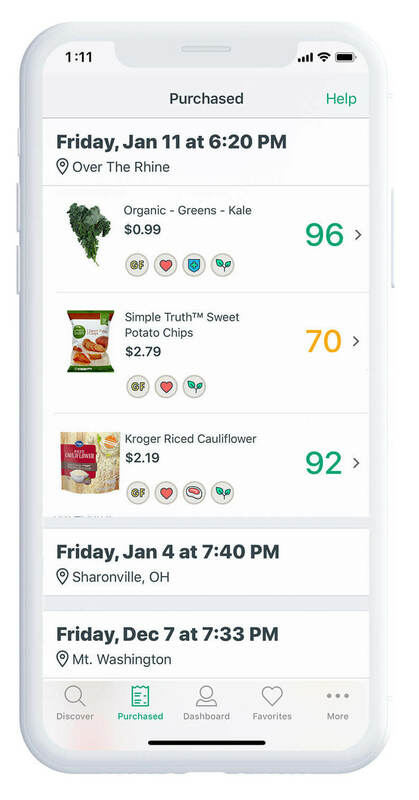 OptUP simplifies healthy choices by providing easy-to-use nutrition ratings and healthy product recommendations by looking at your Kroger Plus Card purchase history. 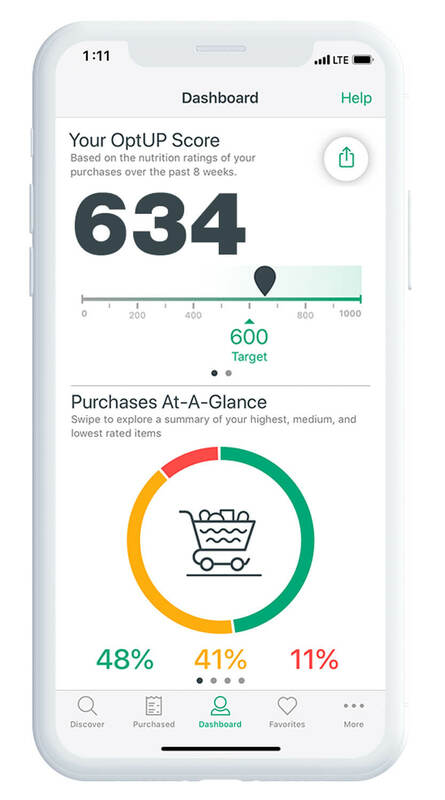 It’s essentially a virtual assistant for healthier shopping. Healthy eating and easy don’t always go together, but this time they do! Download the OptUP app, then log in with your Kroger account information to view your “OptUP Score”. See an aggregate numerical rating (0-1000) for total purchases made in the last 8 weeks. A high score reflects you have made very healthy choices—but don’t fret if your past purchases score low, OptUP recommends healthier product choices for next time. OptUP even categorizes product choices by color in case you don’t have time to click through individual product scores. Here’s the skinny—Green represents the healthiest options, yellow is next best, and then red. Guess what, fruits and veggies score green! What a great reminder to include more in your cart. Visit the Purchased section to view health scores and dietary tags for items you purchased in the past. Product health scores are based on ingredients and nutritional analysis. There is also a Search and Scan feature that can be used for items not on your purchase history list. Some of the health scores can be pretty shocking…eek! OptUP understands and provides Better for You alternatives including high-scoring fruits and vegetables to help you become the healthy shopper you aspire to be. You can add preferred items to Favorites, and also drop them into your Cart for handy curbside pickup or delivery. What About My Special Dietary Concerns? 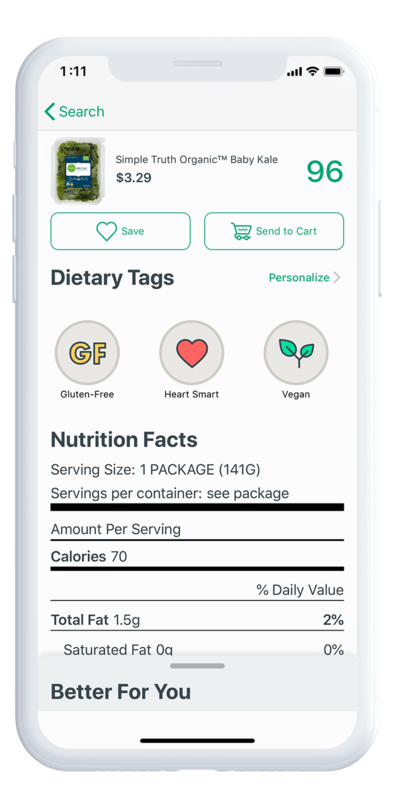 Use Dietary Tags to indicate food types that fit your specific diet. From artificial colors, flavors, and sweeteners to Keto, heart-smart, high-protein, immune-boosting, contains dairy, vegan, and gluten-free… OptUP is conveniently custom. 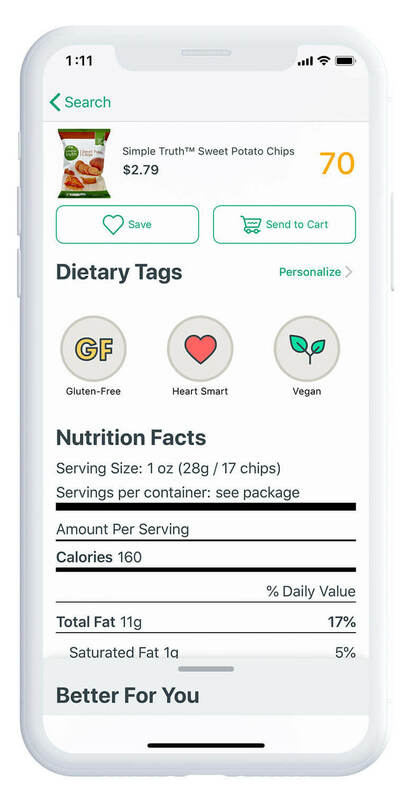 Kroger goes above and beyond their app amenities with an offer to Connect with a Dietician in select markets. Wow, live support in addition to the app…now that will get you shopping green! OptUP Registered Dietician Nutritionist will shop alongside you, helping you to reach your personal healthy shopping goals. Now through February 28th, 2019, you can schedule a FREE 30-minute personal shopping appointment at several Ohio, Kentucky, and Tennessee stores. More information available in the OptUP app. Stick with your healthy eating goals all year long by downloading OptUP in the App Store or Google Play today!